If you haven't stumbled across SoundHound in the Android Market, now is the perfect time to try out the music recognition wonder app, now offering free unlimited searches for your Android device. With SoundHound, you can find most elusive songs by singing or humming a verse, naming all or part of a song with voice search, and by using its lyrics search engine. "Fans of SoundHound drive the direction of the product and their enthusiasm has catapulted us into a leadership position. In recognition of this, we are delighted to announce today that SoundHound is now unlimited and free to use for everyone"
"We're firing on all cylinders and have built strong momentum across various planes in 2010. 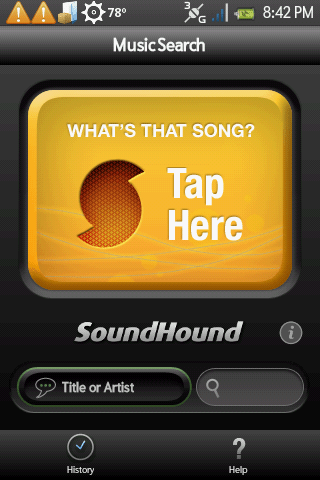 In particular, the dramatic 500 percent increase in new SoundHound users and the increased usage of the appâ€”1,000 percentâ€”emphatically demonstrates user engagement and puts us at the tipping point of mobile music search." Both the free and $4.99 paid version of SoundHound can be found in the Android Market, which you can find by scanning the QR code below with your mobile, or by heading to the Market app and searching keyword SoundHound. You can also find it on AppBrain.